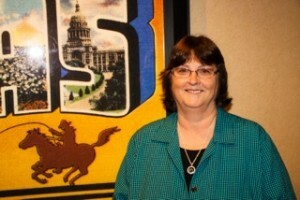 Today I want to welcome my good friend and fellow author, Vickie McDonough, to my blog. Vickie writes inspirational prairie romances that have won multiple awards. 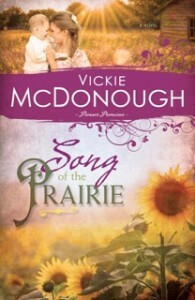 Vickie’s newest book, Song of the Prairie, just released! It’s book 3 in the Pioneer Promises Series. Vickie, please tell us about the heroine in the story. Janie Dunn’s dream of being an opera singer suddenly fades when, at her dying cousin’s request, she flees Boston with her deceased cousin’s newborn son to protect him from his abusive father. She moves to Kansas to live with her brother, but life takes another dire change when he is suddenly killed. Is a marriage of convenience the answer to her problems? Is Kansas far enough away from Boston that they are safe from the baby’s vengeful father? What can you tell us about the hero? I loved writing my hero, Aaron Harper. He’s the oldest of the three Harper brothers and has waited patiently for me to tell his story in the final book of the series. He’s such a good, honorable man, but he’s troubled because he was unable to make his first wife happy. He feels partly responsible for her death even though he wasn’t. I loved giving him the woman he deserves—a woman who could love him as much as he loves her. What type of reserach did you do for this story? I had to do quite a bit of research for Janie’s character. Her dream is to be an opera star and sing on the big stage—and she has the voice for it—but the right doors haven’t opened for her. I had to study opera a bit and learn some musical terminology to make creative analogies and metaphors for her character. This sounds like a great story! I know readers are going to enjoy it. What are the titles of the other books in the series? Whispers on the Prairie and Call of the Prairie. We are giving away a copy of Song of the Prairie to one person who leaves a comment. I’ll choose a winner on Sunday, August 17th. US entries only.